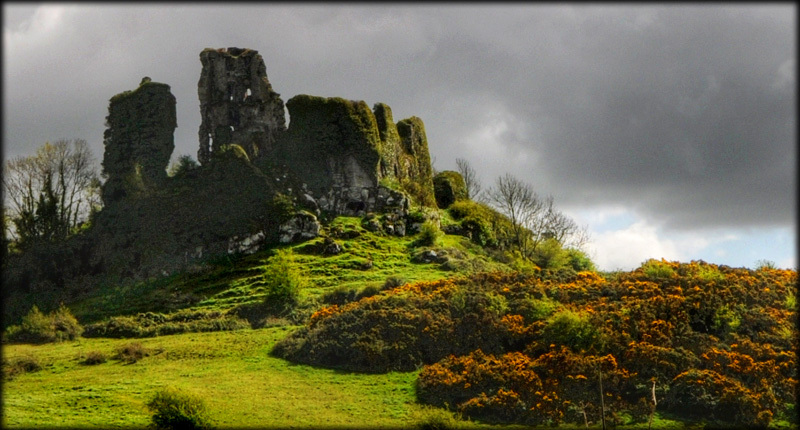 The ruins of Carrigogunnell Castle dominate the lovely pastoral land surrounding the volcanic peak on which it was built mid 15th century on the site of an earlier structure. 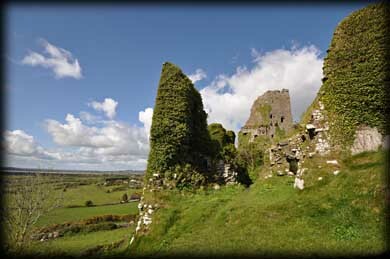 The shattered limestone Keep was once over 50 feet high with 5 stories and a spiral stair, and there was a later house adjoining the tower with additional buildings, all fortified by a strong wall. The land had been granted by King John to Donchad Cairbreach O'Brien in 1209 and had been a very important stronghold of the O'Briens for centuries. 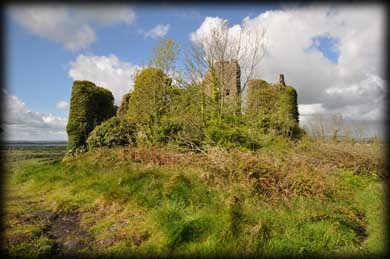 It was destroyed following the 1691 siege of Limerick -- although the garrison sheltered by the castle took no part in the actual siege and surrendered without a fight, the English did not need the castle so they destroyed it with a large quantity of gun powder, attesting to the sad shape that it is in today. Yet the castle has inspired songs to be written about it and is now and has been for generations a place where young people congregate to "sport and play the live long day". We too thoroughly enjoyed our visit to Carrigogunnel. There is a track to the south east that leads right up to the rear of the castle, followed by a very short walk. The views from the ruins here are simply gorgeous. Situated: From Limerick take the N69 South west. After 6k turn right for Tervoe. Then turn left. Take the 2nd right and park at theend of the track. Then walk 50 metres. Discovery Map 65: R 4974 5529. Last visit April 2012.